Raise Alpacas, they said! It will be FUN, they said! They are so friendly, docile, and sweet, they said! Well, lemme tell you about the Alpaca R-O-D-E-O we had going on here today! In the beginning…………………..we have 9 Ladies in Waiting. 1 Lady that we will not breed and 2 that are too young to breed this year. Don’t they all look so gosh darn cute? And then the rodeo began. For genetic reasons unknowns to us the white colored Alpacas grow toe nails like they are on steroids. If we cut everyone’s toenails at the same time, then it’s guaranteed that 4 months later the white ones will be a total mess and others….not at all. 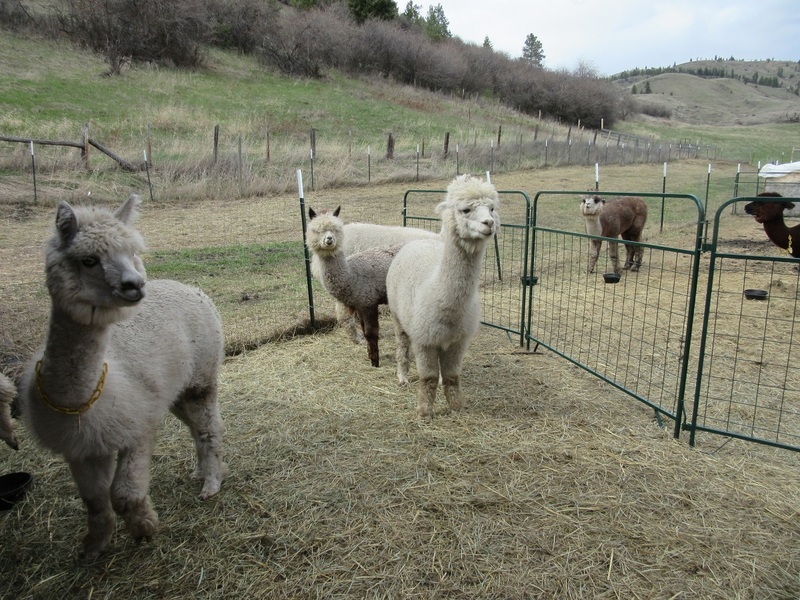 We have on site, 4 white Alpacas and man oh man did they ever need Mani-Pedi’s! 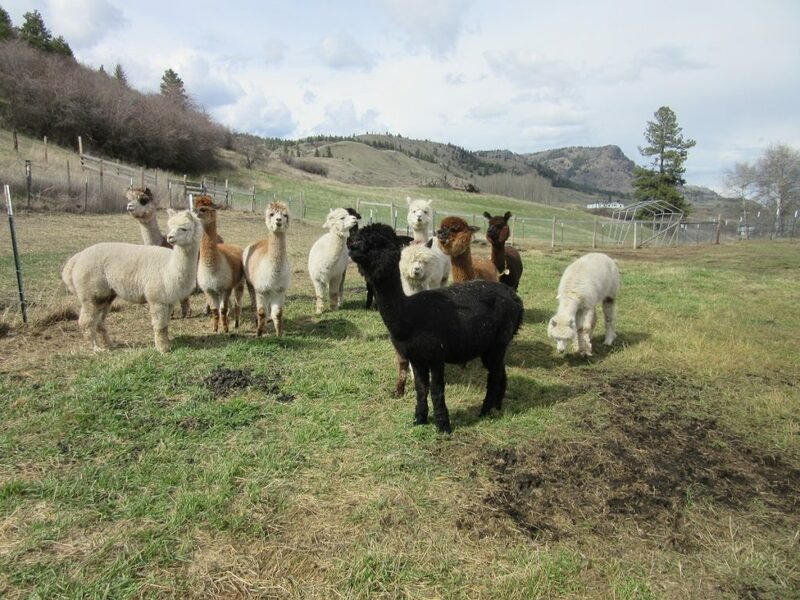 Alpacas do not have hoofs, they have sort of soft/ hard toenails that have to be trimmed. Now, this is NOT a painful experience any more than you and I cutting our nails but Holy Nail Clippers you’d have thought we were killing them! 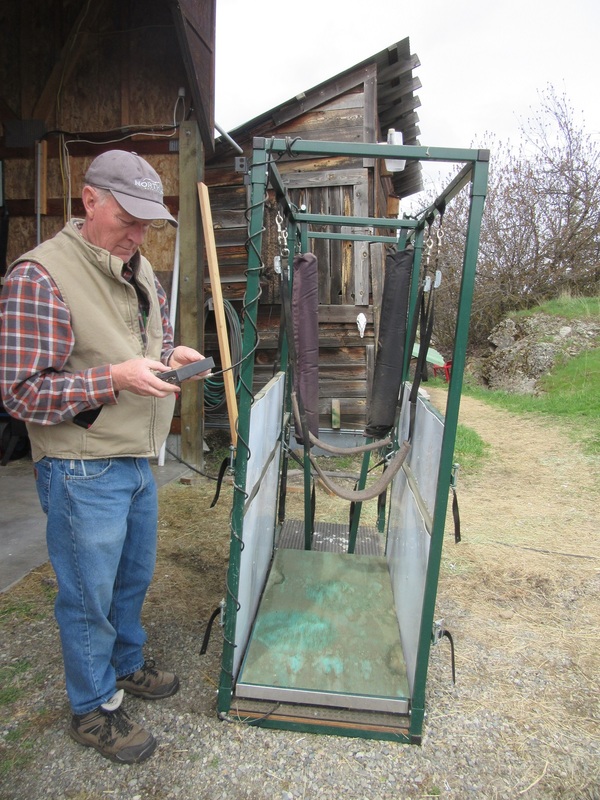 Sparky setting up the Chute to securely and safely hold the girls while we trimmed nails. Dawn was good. Great even! She knows the drill and was a sweetheart….well, compared to the next 3, she was an Angel! Then we caught Morning Glory named because she was born in the early morning on a GLORY-ious 4th of July. At first she was calm and docile but as we lead her out of the pasture to the Chute all heck exploded! Let me tell you, no cowboy riding Fu Man Chu could have stayed on this one! Bucking crazy, hooves flailing, flipping in the air and then it actually got worse! Crack of Dawn comes crashing through the pasture gate to save and defend Morning Glory. At this instant we remembered that Morning Glory was Dawn’s baby and she was going to move Heaven and Earth to save her baby from the kidnappers. Even worse is Antares totally freaks out and tries to jump the Gate getting herself stuck halfway over . OK….so now a bit of panic is setting in as she is STUCK and we think she may end up seriously hurting herself when she gives a mighty push and goes over the Gate doing a back flip and lands on her side. Unscathed, she gets up and dashes off. 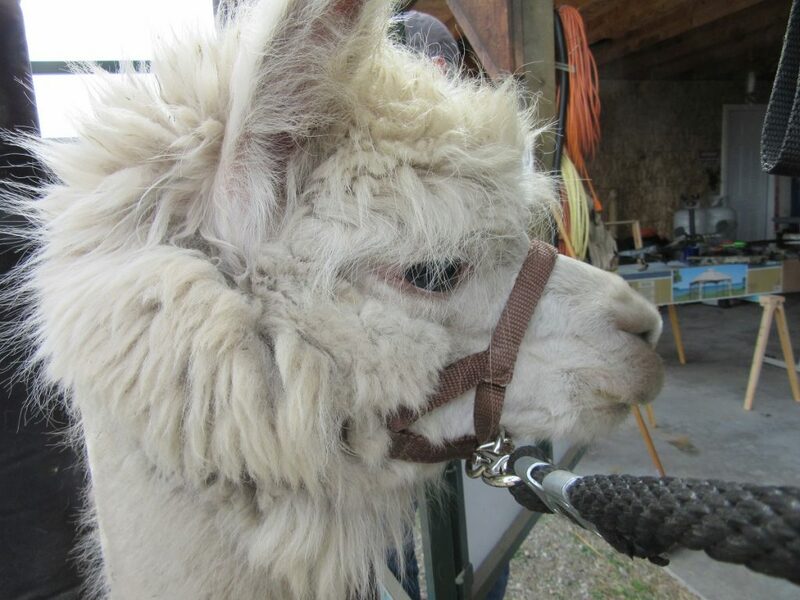 We have only had one other Alpaca go over a Gate before and wouldn’t you know it, it was Antares’ father, Alessio! The rest is just a blur, a total blur, but somehow we got Dawn back into the pasture and Morning Glory up into the Chute where she promptly crashed down inside the Chute and WOULD-NOT-FOR -ANY-REASON stand up! Lifting, pulling, yanking and tugging we finally got the straps hooked up and hauled her to her feet. The she tries to charge forward and Holy Macaroni the Chute starts to tip over on its side! 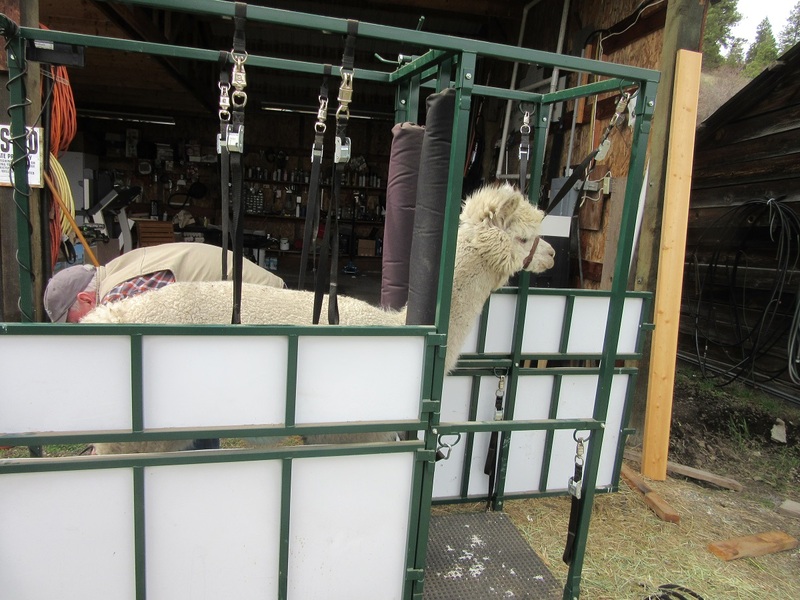 We grab it and stabilize the Chute and the Alpaca. Dan and I are just standing there looking at each other. Really? Really? Just what is going on here today? And of course, the cussing has now begun in earnest. I’m in front with my knee between her 2 front legs, stroking her neck and crooning to her while Dan does her Pedicure. She is trying to kick and carry on but finally she is done and we return her to her mother who has not moved 1 inch from the Gate. Whew…………. Really? Does this look painful? Dangerous? Nope…not even a little bit. Sparky and I are the ones in danger of getting injured, trampled, kicked and spit on, but the girls are perfectly fine. OK…….now it is Antares’ turn. She of “let’s jump the gate” fame. Can this day get any worse? Well, don’t be silly. Of course it can! We catch her and while Sparky is holding this spitfire bundle of fun I am standing in front of her putting on the Halter. Now all you Alpaca owners know what is coming next. Yessirrer! Full Frontal Face Spit! I’m laughing and Dan almost let go of her he is doubled over laughing so hard. I was covered in green stinky “chewing my cud” Alpaca spit! Dan said to me ” You handle these things so much better than me because if she had done that to me I would have……..” We will just leave it at that, OK? To me, it’s just part of what it means to be an Alpaca. When upset or annoyed, they spit. Trust me, I can relate! By the time Sparky took this picture, the spit had dried and the wind blew most of it off. Really Karen, a little Mascara and Lipstick wouldn’t hurt, ya know? And this is what happened next. Or rather what did not happen next. Ms. Antares cushed down and nothing, nothing on this good green earth was going to make to make her rise again! We pushed, pulled yanked and lifted but nope, she was not budging. So Sparking said, “hold the lead, I’m going in.” And he did! Got down and dragged each of Antares’ legs out and gave her a pasture down and dirty Pedicure. And then last but not least, not so little Ms. Blue Moon. Not the best but certainly not the most ill behaved of the group. Stubborn, requiring pushing and pulling but ultimately got her in and got her done! 4, that’s right, 4 Alpacas today. We did herd health on all of 4 Alpacas today. They are fine. Actually better than fine. Their nails are trimmed and life is good for them. But Sparky and I are beat up, tired and sore. But at 7 pm tonight we watched these beautiful, docile, friendly animals grazing in the pasture and know it was all worth it and we’d do it and will do it again tomorrow!. Thanks for stopping by today! Wherever your Journey leads you today , I truly wish you joy and love in all you do. We have a few of them, but most have no problems having their spa day. Don’t know why but they were just not having any part of it yesterday! We recently visited a farm where they created walkways with gravel in high traffic areas and pavers around the feed station. It worked really well for filing down the nails naturally. I think we will do the same and see if we can reduce the number of trims required to keep the toenails in check. Thanks for taking the time to comment and I’m glad you enjoyed our Rodeo story! Dan started out saying “come on sweetie, let’s just be nice.” But by the end of the 2nd Alpaca he was calling them anything but sweetie! Sorry, at one point in your story, I was laughing so Hard! Watched Susan and John do spa day before a show a couple of weeks ago. Then breeding today. Next is shearing. Add dogs, chickens, Never a dull moment on an alpaca farm! Wow….what a workout. I actually laughed out loud reading this. 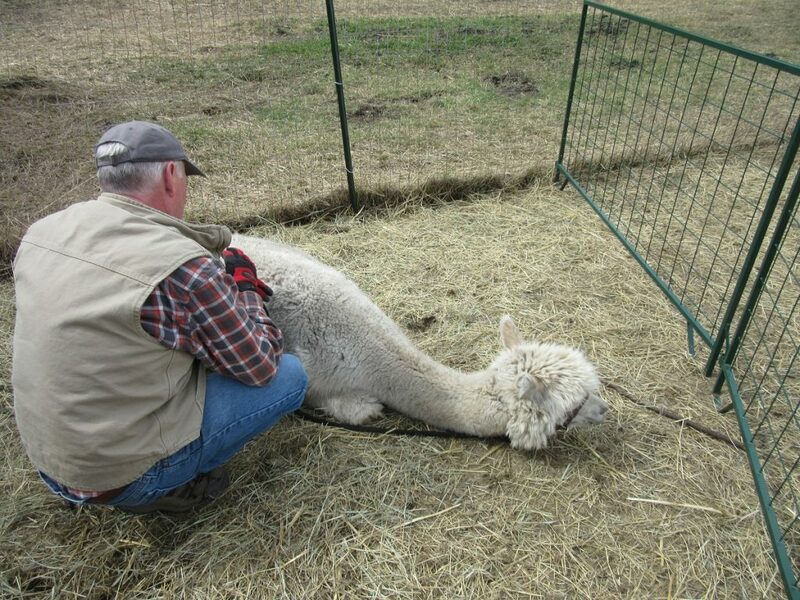 I never knew that alpacas could be so stubborn. I love the picture of not sure if was Morning Glory or Dawnie’s head shot. She looked like she was ticked off for sure. 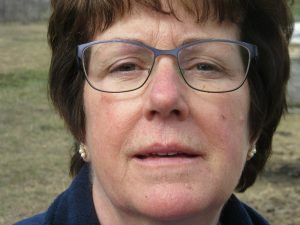 Great story Karen and I could hear your laughter. Omg Karen, you can tell such a great story! Well, I have a never ending supply of great material to work from! Thanks for commenting!